What was an Army Number or Personal Number? Why are Army and Personal Numbers so important? Army and Personal Numbers were brought in following the First World War to help simplify army administration. During the First World War, British Army officers didn’t have a number and other ranks had a regimental number. Though officers did have a long number which covered their service file and correspondence this number doesn’t appear on their medal records, London Gazette entries etc. Regimental numbers were not unique and each corps or regiment numbered its own other ranks. If a soldier was transferred between regiments or corps they received a new regimental number. In addition, there were often multiple men with the same regimental number in each regiment or corps. To simplify the system, after the war, the British Army allotted each officer a Personal Number and each other rank an Army Number which was unique to them. In addition, a soldier would not receive a new number if they were transferred to a different regiment or corps, they kept the same number throughout their service. Army Order 388 of 1920 led to the “substitution of regimental numbers for army numbers” and I have transcribed the passage below. The process took many months to complete and the latest example of a substitution of a regimental number for an army number I have found is May 1921. Below is a page from Martin Thomas’ Army Book 64 Soldier’s Service and Pay Book, a document which has often survived within families. Thomas’ army number was 15426852 from the block allocated to the Royal Artillery and he enlisted at Belfast on 21 October 1939. While Thomas’ Army Book contains a lot of useful information, I would need to order his service record from the Ministry of Defence to research his service career in-depth. Search the surname and number on FindmyPast’s “Military, armed forces & conflict” section. FindmyPast is a subscription site and has a free trial period. FindmyPast has digitized a large number of useful records for the British Army during the war, primarily relating to casualties and prisoners of war. Search the surname and number on the National Archives’ Catalogue. Search the number on The London Gazette which has a very unreliable search system. The London Gazette will be of most use to you if you’re researching an officer as it will provide their promotion dates. You can also search the Commonwealth War Graves Commission website if you don’t know whether they survived the war or not. To research either an officer or other rank who served during the war, you really need to get hold of their service record. Clicking on the banner below will take you to FindmyPast which is the only website I recommend for Second World War British Army documents. The table below records the number blocks allocated to each corps or regiment. However, a soldier could be transferred very quickly after joining a corps or regiment. I have broken the numbers up with commas to make them easier to read. 5,942,001 to 5,998,000 The Bedfordshire and Hertfordshire Regiment 5,950,654 was conscripted on 17 January 1940. Substitution of Army Numbers for Regimental Numbers. 1. With reference to paragraph 1899, King’s Regulations, as amended by Army Order 453 of 1914, it has been decided to substitute a system of army numbers in place of regimental numbers. (a) To all soldiers serving in the Army and the Territorial Force on that date, with the exception of the Labour Corps. (b) To all soldiers serving in the Army Reserve. (c) To all recruits who may in future enlist into the Regular Army, the Militia, Special Reserve, and the Territorial Force. (d) To all men who may re-enlist, who had not been previously allotted an army number. (e) To all soldiers who may be transferred from the Royal Marines. (f) To all deserters who may rejoin, and who have not already been allotted an army number. 3. Army numbers will be allotted by officers i/c records. 4. 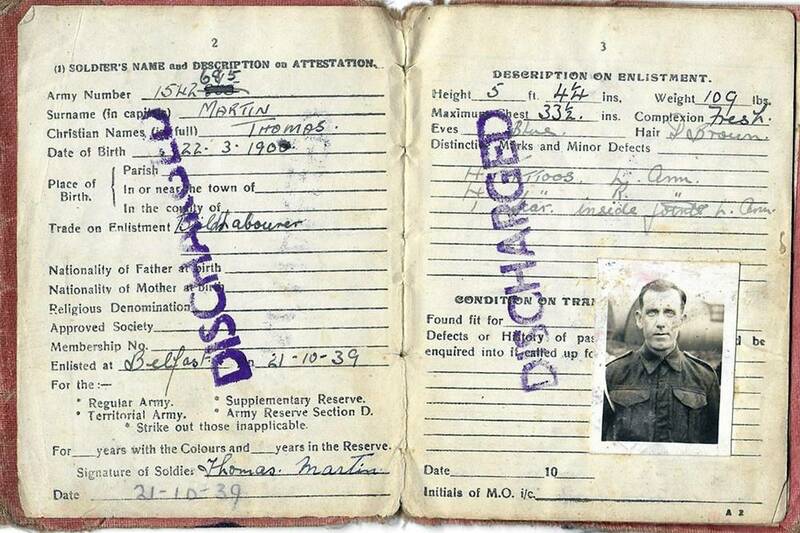 A soldier will retain the army number originally allotted to him throughout his service, irrespective of whether he may subsequently be posted within a corps or transferred to another corps. An ex-soldier who may re-enlist will resume the army number which he previously bore. 5. The London Regiment will be considered a corps for the purpose of this Army Order. 6. Appendix I to this Army Order contains particulars of the blocks of army numbers which are allotted to corps. (a) With the exception of the corps enumerated in (b) officers i/c records will prepare nominal rolls (in the form prescribed in the Appendix II to this Army Order) of all soldiers serving with corps affiliated to their offices, and will allot thereon army numbers. Copies of the rolls will be forwarded by them to officers commanding regular units and regimental paymasters. Royal Horse and Royal Field Artillery. Royal Garrison Artillery. Royal Engineers. Royal Corps of Signals. Royal Army Service Corps. Royal Army Medical Corps. Royal Army Ordnance Corps. Royal Army Veterinary Corps. On receipt of these rolls officers i/c records will allot a number to men enumerated on the rolls and will forward completed copies to officers commanding regular units and regimental paymasters. (c) Officers commanding regular units will publish in Part II Orders particulars of army numbers allotted. Such orders will show both regimental and army numbers. They will also enter the army numbers in duplicate attestations and all other documents relating to soldiers. (i) In the case of the corps mentioned in sub-paragraph (b) above for a period of two months. (ii) In the case of all other corps for a period of one month. 9. Officers i/c records will allot army numbers to all soldiers who have already joined the new Territorial Force, and whose attestations they hold. They will forward nominal rolls showing the allotment of army numbers to officers commanding units and regimental paymasters. The former will publish the army numbers allotted in Part II Orders. (a) Officers i/c records will forward to regimental paymasters nominal rolls (showing former regimental numbers and army numbers allotted) of all men serving in the Army Reserve. (b) Officers i/c records will recall the identity certificates of the men referred to in (a), delete therefrom the words “Regtl. Number” and the number already recorded, and insert instead the words “Army Number” and the new number allotted. In returning the amended certificate to the reservist, a slip will be attached directing his attention to the new army number allotted to him.